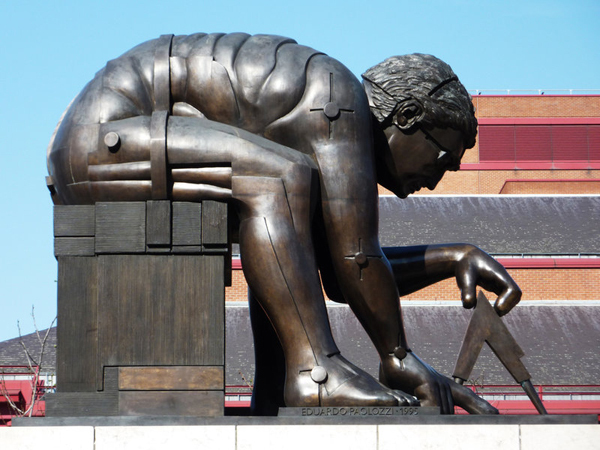 This tribute to Sir Isaac Newton by artist Eduardo Paolozzi shows him in the unusual pose of being seated and leaning over with compass in hand. Installed in the British Library‘s courtyard off Euston Road in 1997, the 12 foot high bronze is based on a large watercolour by Romantic Age poet and artist William Blake, one of a series of 12 he produced in Lambeth in the 1790s. It’s on show at the Tate Britain. The statue was given a voice in 2014 as part of the Talking Statues project. PICTURE: British Library.